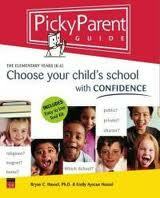 The Picky Parent Guide is now available in single chapter pdfs – see below for all the content in the book. Choose the chapters that will make the most difference for you or download the whole book! If you would rather have the full book in paperback you can still buy the book at Amazon.com. Help parents get the help they need. Link to this page on your parent or community website! Chapter 11 – What Really Separates the Best from the Rest? As the son of a public school teacher, the father of four children educated in public schools, and someone who has spent over 30 years working to improve public education, I can say this book will be an invaluable guide for parents who are seeking what’s best for their children.